I have fond childhood memories of sitting down for dinner with a big bowl in the center of the table. 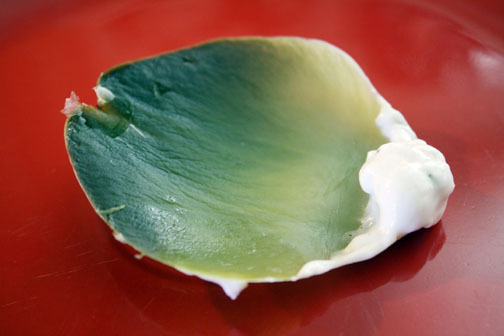 I’d scrape a leaf of a boiled artichoke with my bottom teeth and toss the leaf into the bowl. My parents would do the same, which made dinnertime all the more fun. Fresh artichokes are a small luxury if you live in Alaska. They aren’t cheap and often they don’t make it up here in great shape. Every once in a while the grocery store will have an artichoke special and that’s when I make a simple appetizer of boiled artichokes. Dip each leaf into melted butter or make a creamy dressing like this recipe. I’ve also included step-by-step instructions on how to eat an artichoke in case you’ve never had the opportunity. If your artichoke has lots of pokey spikes on the tips of the leaves, chop a few inches off the top of the bloom. It’s not necessary, but it makes the artichoke easier to handle. Place your artichokes in a large stockpot and fill the pot with water. 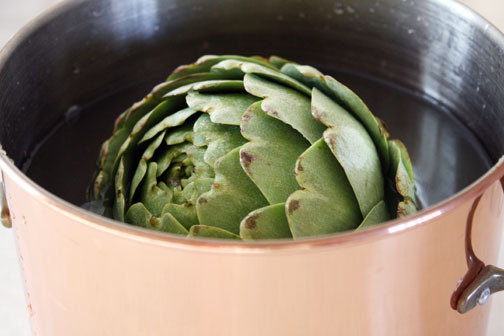 Your artichokes will probably float, but that’s ok. Place a tight-fitting lid on the pot and place over high heat. 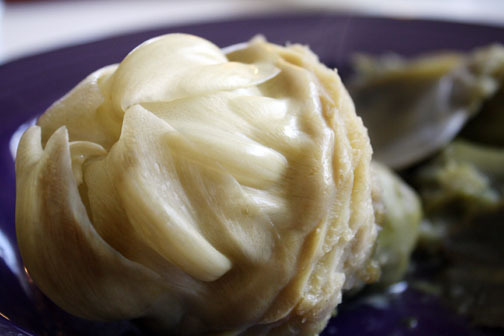 Once boiling, turn down the heat to medium-low and allow artichokes to boil for 45 minutes. While artichokes boil, combine the other ingredients in a small bowl. Cover with plastic wrap and refrigerate till artichokes are done. To test the doneness of your artichokes, tug at one of the inner leaves with some tongs. If the leaf pulls out easily, your artichoke is done. 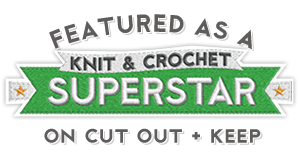 If you have to tug on it for a while before it comes out, it’s not ready. Boil another 5 or 10 minutes. When your artichokes are done, transfer them to shallow bowls with a small sieve or slotted spoon. Let them cool for 5 minutes before eating. Allow the cooking water to cool to room temperature and use it to water your plants. 3. Remove a leaf and scrape the lower inside half of it with your teeth (I prefer to use my lower teeth, but whatever seems right for you is good). 5. Eat as many leaves as you can in this fashion, turning the artichoke as you go. 7. When the leaves get too thin and tender, use a spoon to scrape them away. Beneath these leaves will be a layer of hairy bits. Scrape all the hairs away and you’ll reveal the heart of the artichoke. This is my favorite part. Dip the whole heart into your creamy sauce and eat all of it but the stem.